A wide range of high pressure compact laminate solutions perfect for interior and exterior applications. Compact laminates use durable and self-sustainable high pressure boards which come in a thickness ranging from 4mm – 30mm and Dimensions - 4’ x 8’, 4’ x 10’, 4.25' x 10', 5' x 12' and 6’ x 12’ Engineered with indigenous technology, our compact laminate solution comes with Anti-bacterial properties, abrasion, water and fire resistance. 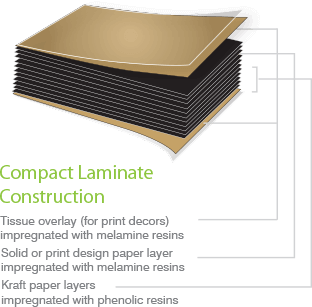 Compact laminate are used for both Exterior and Interior applications, ideal for Restroom Cubicles, Lockers, Furniture, Panels, Work tops, Lab furniture, Facades etc.